This is a 2018 article update on the Old Fort Gun Club. A club in Western Arkansas that is unsurpassed anywhere in the region for quality, development, access, and management. Anyone in the Fort Smith Arkansas metro area has a place to shoot. 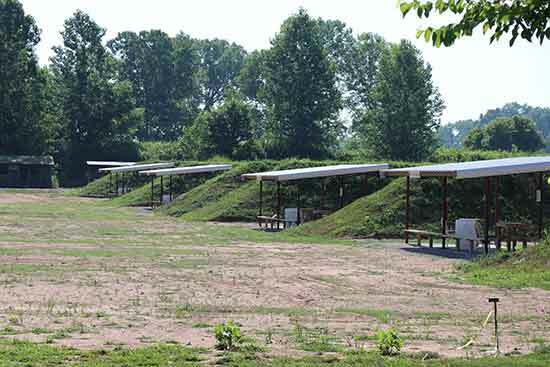 In this update, I replaced the dreary looking winter pictures with these, late spring ones of the gun club that continues to be in development, having a number of new bays added to the fourteen pistol bays already in use. So, to illustrate the quality of the club, and the solid array of shooting opportunities, following are pictures taken in June, 2018. You won't find any lack of patriotism representing the OFGC. That starts at the gate and is confirmed with the members you'll meet. 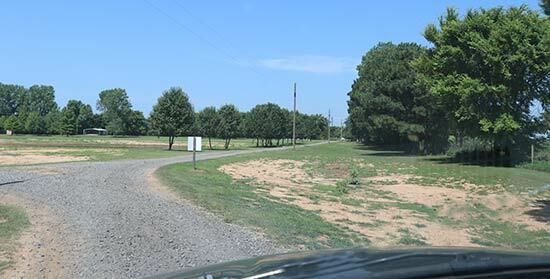 As you drive in the OFGC gate and begin down the drive, you can see the tree lined gravel road that encircles the entire range, except the 300 yard range. It is always grated, and well maintained. The range is not just set to shoot in. It is kept as attractive as possible by maintenance of the road, trees, and grass. The gun club dues are only $120.00 per year (also requires an NRA membership) for full access. Members get a combination to the gate lock with access to the club 7 days a week, 365 days per year. 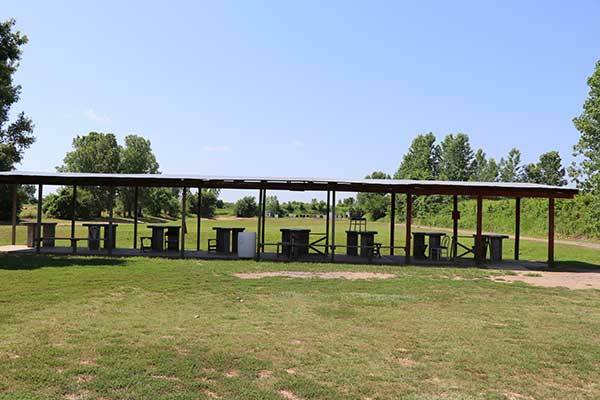 The Old Fort Gun Club holds shooting contests throughout the majority of the year including IPSC, Cowboy Action, Three Gun, Clay Pigeon Shoots, Youth, and much more. Below are pictures of what is available at the club. Where I usually show up is at any one of the bays lining the outer edge of the club. These are primarily pistol bays, with some now deeper; 35 yards, 50 yards, 65 yards (newest). They are excellent for practice, gun testing, training. In the deeper bays, targets of all types can be set up allowing you to walk, turn, run, drop, whatever you need to do to maximize the time on your pistol trigger. The bays can also be used with rifles such as ARs, .22s, shotguns (limited to your own target stands), etc. At this writing, I believe that after the recent construction of the latest bays, there are now 21 available to shooters. 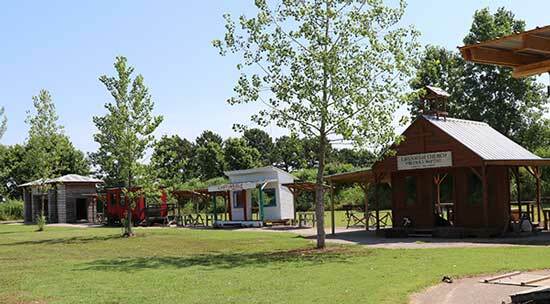 All have covered shooting pavilions, tables, chairs, concrete floors, etc. Each bay has a couple of target backings provided. You may bring any of your own kinds of targets and stands, staying within the club guidelines for shooting. The view below is of one of our typical target setups we use for training (and loads of fun). 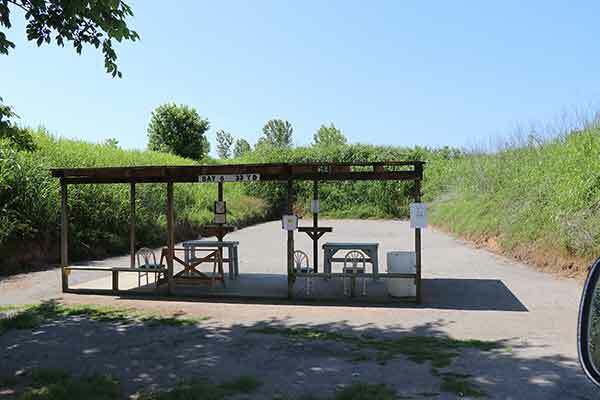 Regardless of the type shooting you do, you can set up for it at the Old Fort Gun Club. Below is a picture of the 100 yard range. Low berms at various distances are for .22s. All other shooting is to the 100 yard berm. 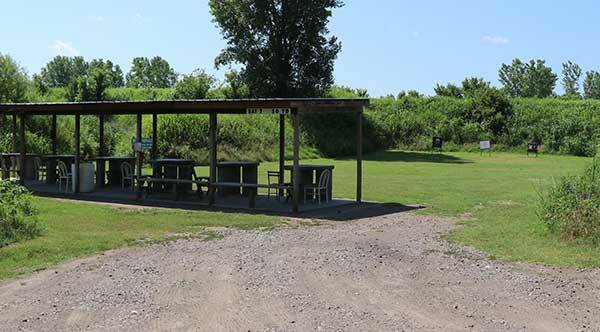 A popular spot for people plinking, sighting in their competition rimfires, etc. 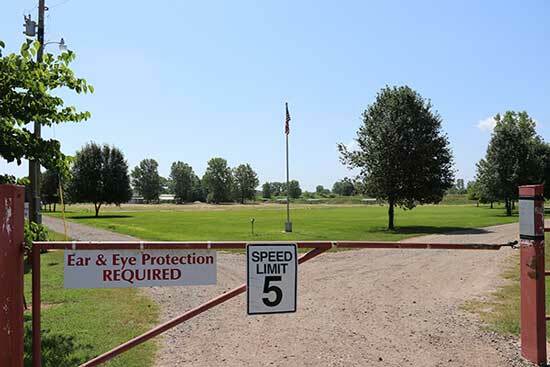 For serious, longer range riflemen and women, the 300 yard range is a popular stop for sighting in hunting rifles and competition guns at 100, 200, and 300 yard lines. And a good spot for bragging rights if you get that rifle zeroed at 300 yards. Actually people you meet here are helpful, and will usually offer help and advice if needed for people learning their rifle skills. 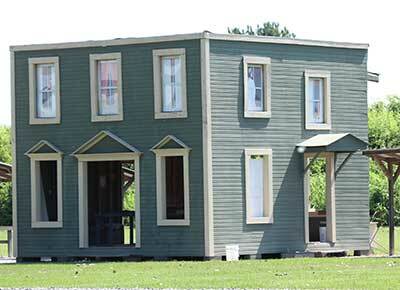 If you've ever fancied getting into old west style shooting, this is your club. 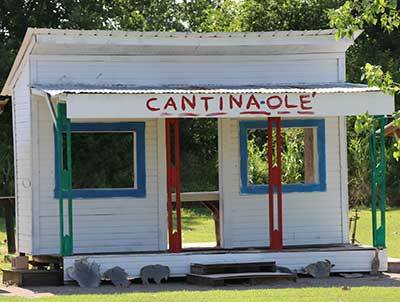 It regularly hosts events, large and small, for a regular bunch of cowboy action shooters. The stages tell the story. The fun is unmatched, and the shooting is impressive. They always welcome new people interested in this style of shooting. That's about the most justice I can do this great organization and facility from this web page. If you want a place to shoot in the Fort Smith - Van Buren area, this is it. The cost is ridiculously low. The club is open 365 days per year. Attend one club meeting the first Thursday night of any month. Bring your membership form and payment. Introduce yourself in the meeting. Get your badge that night; ready to shoot the next day. For families, either husband or wife may join. Spouses and all children under 20 years old will get membership badges. All for the cost of just one. For single parents, the parent and all children under 20 become members with one membership. You get a badge, a combination to the gate lock. Come and go as you please. Shoot and train as much as you want. Teach your kids to appreciate, and use firearms safely and skillfully. No downside to becoming a member of the Old Fort Gun Club.